"RBE" redirects here. For other uses, see RBE (disambiguation). Not to be confused with the tissue sensitivity weighting factor Wf used in calculating the effective dose (radiation safety). In radiobiology, the relative biological effectiveness (often abbreviated as RBE) is the ratio of biological effectiveness of one type of ionizing radiation relative to another, given the same amount of absorbed energy. The RBE is an empirical value that varies depending on the particles, energies involved, and which biological effects are deemed relevant. In ionizing radiation dosimetry RBE is now represented in the recommendations of the International Commission on Radiological Protection (ICRP) by the radiation weighting factor, (WR) for each type of radiation; it was formerly the quality factor (Q). These weighting factors convert absorbed dose (measured in SI units of grays or non-SI rads) into formal biological equivalent dose for radiation exposure (measured in units of sieverts or rem). 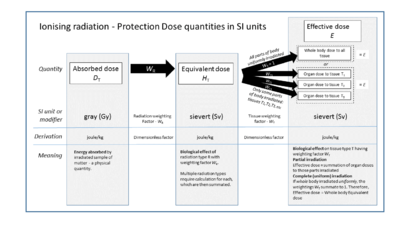 The higher the RBE or weighting factor for a type of radiation, the more damaging it is, and this is incorporated into the calculation to convert from gray to sievert units (seeaccompanying diagram). where DX is a reference absorbed dose of radiation of a standard type X, and DR is the absorbed dose of radiation of type R that causes the same amount of biological damage. Both doses are quantified by the amount of energy absorbed in the cells. Different types of radiation have different biological effectiveness mainly because they transfer their energy to the tissue in different ways. Photons and beta particles have a low linear energy transfer coefficient, meaning that they ionize atoms in the tissue that are spaced by several hundred nanometers (several tenths of a micrometer) apart, along their path. In contrast, the much more massive alpha particles and neutrons leave a denser trail of ionized atoms in their wake, spaced about one tenth of a nanometer apart (i.e., less than one-thousandth of the typical distance between ionizations for photons and beta particles). The concept of RBE is relevant in medicine, such as in radiology and radiotherapy, and to the evaluation of risks and consequences of radioactive contamination in various contexts, such as nuclear power plant operation, nuclear fuel disposal and reprocessing, nuclear weapons, uranium mining, and ionizing radiation safety. Radiation weighting factors that go from physical energy to biological effect must not be confused with tissue weighting factors. The tissue weighting factors are used to convert an equivalent dose to a given tissue in the body, to an effective radiation dose, a number that provides an estimation of total danger to the whole organism, as a result of the radiation dose to part of the body. To bypass the complexity of tissue dependence, the ICRP defined standard radiation weighting factors, independently of tissue type, to be used for risk and exposure assessment in radiology and the nuclear industry. These values are conservatively chosen to be greater than the bulk of experimental values observed for the most sensitive cell types, with respect to external (external to the cell) sources. Values for internal sources for heavy ions, such as a recoil nucleus, have not been developed. The ICRP 2007 standard values for relative effectiveness are given below. Thus, for example, a given amount of energy absorbed in the form of 15 keV neutrons should be assumed to produce 10 times the damage caused by an equal amount of energy absorbed as X-rays or gamma rays. LD-50 limit for CHO-K1 cell line irradiated by photons (blue curve) and by carbon ions (red curve). Typically the evaluation of relative biological effectiveness is done on various types of living cells grown in culture medium, including prokaryotic cells such as bacteria, simple eukaryotic cells such as single celled plants, and advanced eukaryotic cells derived from organisms such as rats. The doses are adjusted to the LD-50 point; that is, to the amount that will cause 50% of the cells to become unable to undergo mitotic division (or, for bacteria, binary fission), thus being effectively sterilized — even if they can still carry out other cellular functions. The types R of ionizing radiation most considered in RBE evaluation are X-rays and gamma radiation (both consisting of photons), alpha radiations (helium-4 nuclei), beta radiation (electrons and positrons), neutron radiation, and heavy nuclei, including the fragments of nuclear fission. For some kinds of radiation, the RBE is strongly dependent on the energy of the individual particles. Early on it was found that X-rays, gamma radiation, and beta radiation were essentially equivalent for all cell types. Therefore, the standard radiation type X is generally an X-ray beam with 250 keV photons. As a result, the relative biological effectiveness of beta and photon radiation is essentially 1. For other radiation types, the RBE is not a well-defined physical quantity, since it varies somewhat with the type of tissue and with the precise place of absorption within the cell. Thus, for example, the RBE for alpha radiation is 2–3 when measured on bacteria, 4–6 for simple eukaryotic cells, and 6–8 for higher eukaryotic cells. According to one source it may be much higher (6500 with X rays as the reference) on ovocytes. The RBE of neutrons is 4–6 for bacteria, 8–12 for simple eukaryotic cells, and 12–16 for higher eukaryotic cells. In the early experiments, the sources of radiation were all external to the cells that were irradiated. However, since alpha particles cannot traverse the outermost dead layer of human skin, they can do significant damage only if they come from the decay of atoms inside the body. Since the range of an alpha particle is typically about the diameter of a single eukaryotic cell, the precise location of the emitting atom in the tissue cells becomes significant. For this reason, it has been suggested that the health impact of contamination by alpha emitters might have been substantially underestimated. Measurements of RBE with external sources also neglect the ionization caused by the recoil of the parent-nucleus due to the alpha decay. While the recoil of the parent-nucleus of the decaying atom typically carries only about 2% of the energy of the alpha-particle that is emitted by the decaying atom, its range is extremely short (about 2–3 angstroms), due to its high electric charge and high mass. The parent nucleus is required to recoil, upon emission of an alpha particle, with a discrete kinetic energy due to conservation of momentum. Thus, all of the ionization energy from the recoil-nucleus is deposited in an extremely small volume near its original location, typically in the cell nucleus on the chromosomes, which have an affinity for heavy metals. The bulk of studies, using sources that are external to the cell, have yielded RBEs between 10 and 20. In 1931, Failla and Henshaw reported on determination of the relative biological effectiveness (RBE) of x rays and γ rays. This appears to be the first use of the term ‘RBE’. The authors noted that RBE was dependent on the experimental system being studied. Somewhat later, it was pointed out by Zirkle et al. (1952) that the biological effectiveness depends on the spatial distribution of the energy imparted and the density of ionisations per unit path length of the ionising particles. Zirkle et al. coined the term ‘linear energy transfer (LET)’ to be used in radiobiology for the stopping power, i.e. the energy loss per unit path length of a charged particle. The concept was introduced in the 1950s, at a time when the deployment of nuclear weapons and nuclear reactors spurred research on the biological effects of artificial radioactivity. It had been noticed that those effects depended both on the type and energy spectrum of the radiation, and on the kind of living tissue. The first systematic experiments to determine the RBE were conducted in that decade. ^ Sinclair DW (January 2003). "Relative biological effectiveness (RBE), quality factor (Q) and radiation weighting factor (Wr)". Annals of the ICRP. ICRP Publication 92. 33 (4). ISBN 978-0-08-044311-9. ^ a b "The 2007 Recommendations of the International Commission on Radiological Protection". Annals of the ICRP. ICRP publication 103. 37 (2–4). 2007. ISBN 978-0-7020-3048-2. Retrieved 17 May 2012. ^ Nagasawa, H.; Little, J. B. (1992-11-15). "Induction of sister chromatid exchanges by extremely low doses of alpha-particles". Cancer Research. 52 (22): 6394–6396. ISSN 0008-5472. PMID 1423287. ^ Winters TH, Di Franza JR (February 1982). "Radioactivity in cigarette smoking". The New England Journal of Medicine. 306 (6): 364–5. doi:10.1056/NEJM198202113060613. PMID 7054712. ^ Zhu G, Zhang CY (December 2014). "Functional nucleic acid-based sensors for heavy metal ion assays". The Analyst. 139 (24): 6326–42. Bibcode:2014Ana...139.6326Z. doi:10.1039/C4AN01069H. PMID 25356810. ^ Barton JK (1994). "Chapter 8: Metal/Nucleic-Acid Interactions" (PDF). In Bertini I, Gray HB, Lippard SJ, Valentine JS (eds.). Bioinorganic Chemistry. Mill Valley, Calif.: Univ. Science Books. pp. 455–503. ISBN 0-935702-57-1. ^ Kim S, Shin W, Warrant R (1985). "Heavy metal ion-nucleic acid interaction". Diffraction Methods for Biological Macromolecules Part A. Methods in Enzymology. 114. pp. 156–67. doi:10.1016/0076-6879(85)14016-4. ISBN 978-0-12-182014-5. ^ Chambers DB, Osborne RV, Garva AL (2006). "Choosing an alpha radiation weighting factor for doses to non-human biota". Journal of Environmental Radioactivity. 87 (1): 1–14. doi:10.1016/j.jenvrad.2005.10.009. PMID 16377039.